First things first, I’ve been making fresh pasta every week since I got back from Italy. I used to think it was too much work to make it fresh. Why go through all that trouble when you can just open a box? And for the most part that’s true, but making pasta dough is actually kind of fun and not nearly as troublesome as I thought. Once you get the hang of it, it’s downright easy. Especially since I found this fabulous technique where you just roll the dough out super thin, coat it in flour, then roll it up like a cigar. Just cut off little pieces and you have noodles. It’s amazing! So, what does all of that have to do with knives? Nothing, other than I’m hosting my first-ever giveaway! 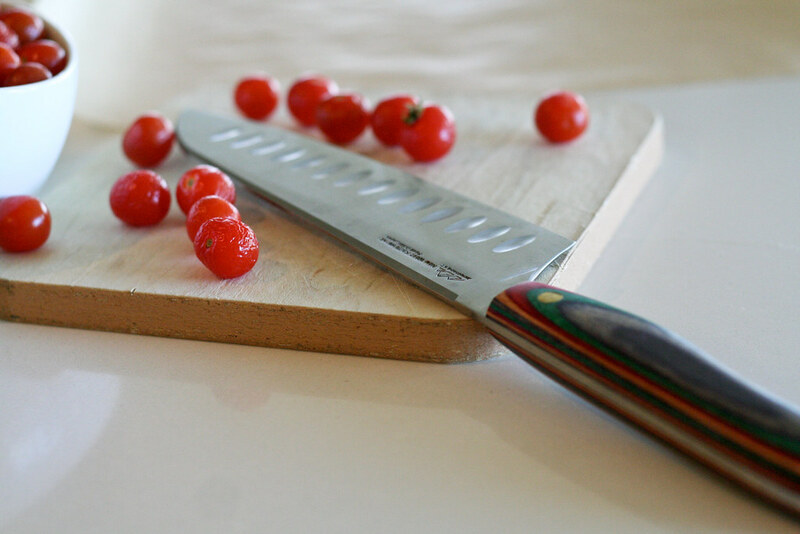 Just like every girl needs a little black dress, every cook needs a really good knife. The nice people at New West KnifeWorks sent me a beautiful Santoku to test out. (Isn’t it just lovely?) To be honest, I’ve been lusting after one of these beauties for the past 2 years. After trying my knife out for the past 2 weeks, I’m sorry I didn’t buy one sooner. This is the Mercedes of knives. It feels wonderfully luxurious in your hands and chops like a dream. It also comes with a matching leather sheath – what more could you ask for? The Contest: Leave a comment about what you’d like to see more of on this blog. It can be a type of food (Spanish, baked goods, salads) or an actual recipe. The winner will be chosen at random and will receive the Fusionwood Knife of your choice. Contest ends Friday, May 21st at 12pm EST. Place your flour on a clean surface and make a big well in the middle. Crack your eggs into the well. Using your hands (it’s easiest) mix the dough together until well-combined then knead the dough until it’s smooth and not sticky. You may need to add more flour as you go. Form a ball and cover the dough with plastic wrap and let it sit for about 2 minutes. 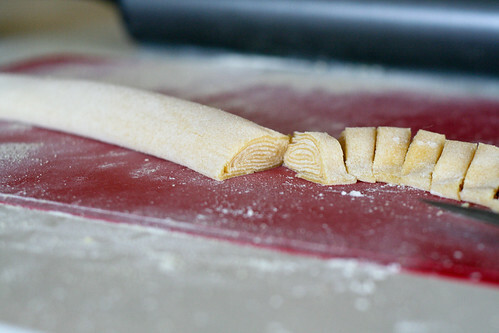 Once it’s rolled out, sprinkle with more flour and roll it like you would a cigar (see photo). Using a sharp knife, cut off small, 1/4 or 1/2-inch pieces. 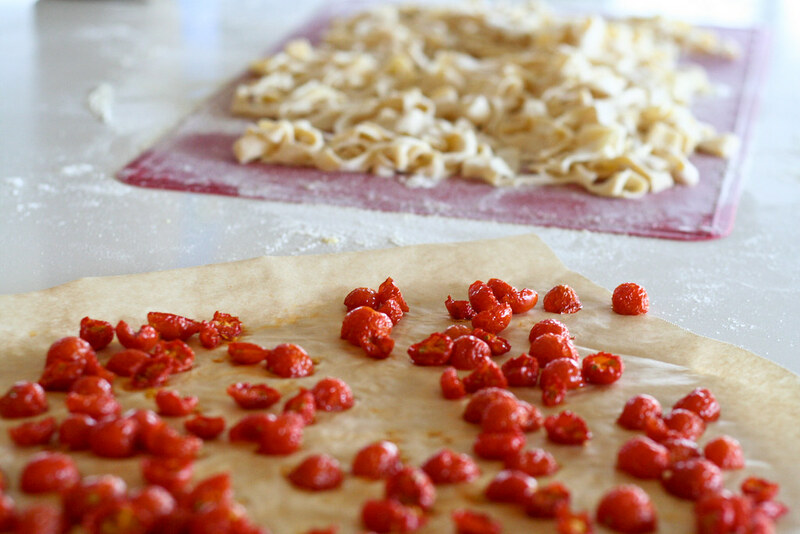 Once you’re done, sprinkle with more flour and gently toss with your hands to unravel the noodles. Repeat with second half of dough. Can be refrigerated for a day or two, but is best used right away. Gently drop the noodles into liberally salted boiling water for about 1 minutes. Remove with tongs or a slotted spoon into a pan with sauce or drizzle with olive oil. Place the tomatoes on a cookie sheet and into a 200° oven for about 2 hours. Set aside. Heat a large skillet over medium. Once it’s hot, add the heat the olive oil and add the oregano, pepper and anchovies. Cook for about 5 minutes, or until the anchovies dissolve. Add the tomatoes and breadcrumbs and cook for another 5 minutes or until the breadcrumbs become golden and toasty. 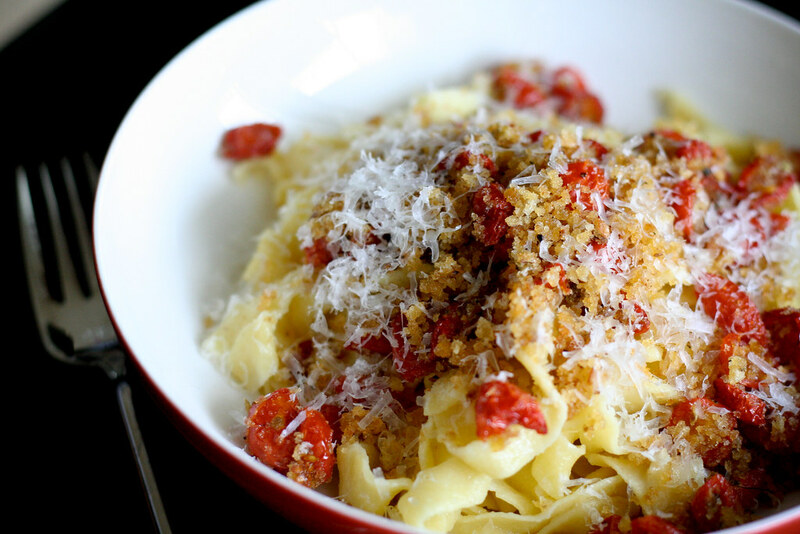 Toss with pasta and serve. *Just pulse a stale baguette in the food processor. Use what you want and freeze the rest. 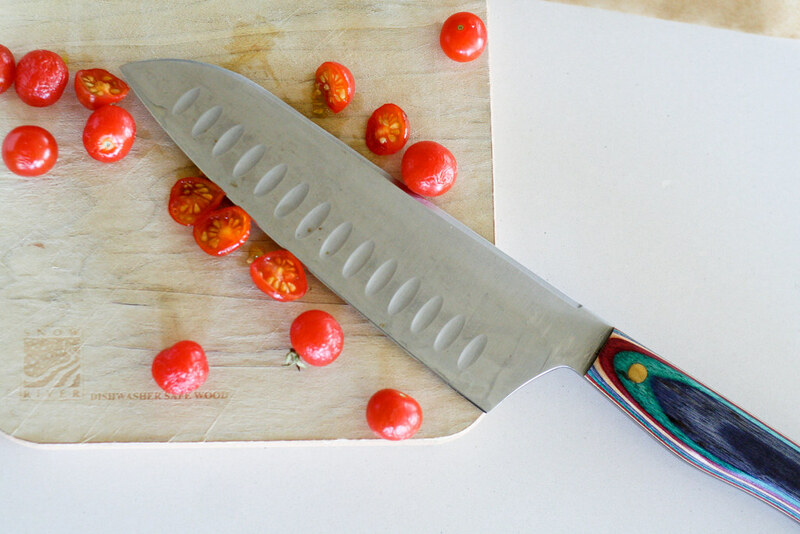 What a gorgeous knife … I’m new to your blog … but since summer is just around the corner I’d be interested in seeing more salads on your blog. I’m a carb addict too…. How about more quick meals. During the week I need to come up with something quick or we’ll be eating dinner in bed. Just found your blog and love it. Found about 6 recipies that I had to try and have only been looking at the blog for about 5 minutes! Have totally changed my lifestyle due to health reasons, and love anything low carb, low sugar! Keep up the great work! Wow, I LOVE this pasta technique. So cool. Thanks for sharing.